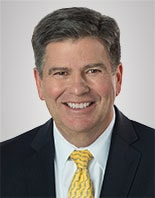 Doug Edwards was elected interim General Counsel of Wells Fargo & Company, with responsibility for the company’s legal affairs, in March 2019 and has served as an Executive Vice President since June 2014. He is a member of the Wells Fargo Operating Committee and is based in Charlotte, North Carolina. Doug has served at Wells Fargo and predecessor companies for more than twenty years in a variety of leadership roles. From July 2014 to March 2019, he served as Deputy General Counsel leading the Legal Department’s Global Commercial and Securities Division, which provides legal support for the commercial and institutional securities businesses both within the United States and internationally. Prior to that, he was an Assistant General Counsel leading the General Litigation Section of the Litigation and Workout Division of the Legal Department from January 2009 to June 2014 and also served as head of the Litigation Practice Group at First Union Corporation and, following its merger with Wachovia Corporation in 2001, at Wachovia Corporation until its acquisition by Wells Fargo in 2008. Doug earned an undergraduate degree from the University of Virginia, an M.A. from the University of Kentucky and a J.D. from the University at Buffalo School of Law.